With the addition of successive units of variable inputs to fixed amount of other factors, there is a proportionate increase in total output. In other words, when the units of variable factors are increased with the units of other fixed factors, the marginal productivity remains constant. It is called constant return. Some factors (labor and capital) are assumed to be variable. There is no increase in the price of raw materials. There is no change in the price of factors of production. The supply of various factors for an industry should be perfectly elastic. All units of variable factors of production are equally efficient. At the optimum level of production, the managerial productivity of the variable factors remains constant with the increased units of these factors are shown in the above schedule. With the further application of the units of labor and capital, the marginal productivity remains constant i.e., 8 units. Then the total productivity of the product increases with the proportionate increments. In terms of cost, the law of constant returns means, the constant marginal cost as the industry expanded. So by constant returns, we are on the path of the optimum business unit. 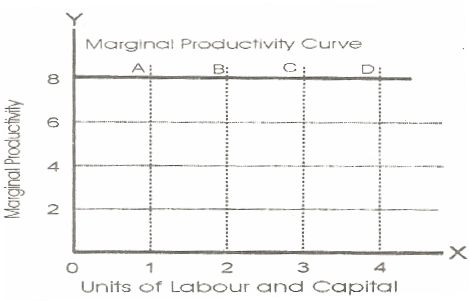 The unit of labor and capital (variable inputs) are measured on X-axis, while marginal productivity of these inputs on Y-axis. By schedule, we have taken A, B, C and D points. Marginal productivity curve of constant returns is obtained by joining these points. This curve has zero slope and parallel to X-axis. This law operates for a very short period when the marginal returns move towards optimum level of production and remains constant for short period, then begins to decline. This law is applicable in those sectors where human and natural factors play their role, for example, in industry making blankets, pure natural wool is used while blankets are prepared in the presence of human factors. Such factors where economies of human and natural factors are presented which counter balanced each other and productivity is provided with constant rate. This law is more applicable in such sectors where labor's role is greater than other factors of production. The law of constant returns operates by increasing the units of labor force.